Before federal prosecutors got involved, two brothers in Arizona set up a $23 million shop raking in money from emails and phone calls. No, they were not posing as Nigerian princes in need of loans, but rather, people doing good for law enforcement, autism awareness, and holding onto Republican seats. Telemarketing tactics vary by each network of PACs, and sometimes the scammers own the firms doing the telemarketing and fundraising. According to the Center for Responsive Politics, scam PACs are a “know-it-if-you-see-it situation.” Some key features include spending a majority of money raised on fundraising and operating expenses, but little on contributing to actual candidate committees or independent expenditures. However, without much information about how scam PACs work or how to spot one, it’s easy for people, and especially the elderly, to fall for them and make a donation. While the Federal Election Commission exists to deal with campaign finance matters, it lacks “the tools or the authority needed to address scam PAC activity.” Or at least, that’s what the FEC chairwoman, Ann M. Ravel, claimed in July 2015. Ravel explained that five years ago, the FEC reviewed complaints that former Rep. Allen B. West made regarding Republican Majority Campaign PAC. West alleged that the PAC solicited donations on his behalf without authorization, and then spent almost all of the contributions, more than $1 million total, on “operating expenditures.” Despite the PAC’s activities, the FEC found “no reason to believe” that the PAC was responsible for fraudulent misrepresentation. The FEC faces an enforcement challenge. In a 2016 memo, commissioners wrote that by the Federal Election Campaign Act, committees must report donations, but the law provides room for political committees on how to spend the money they’ve raised. But the D.C. Circuit Court ruled that the naming restriction was unconstitutional because it was a “content-based restriction on political speech.” The Court ordered the FEC to stop enforcing the naming restriction. The Campaign Legal Center says that due to this decision, a scam PAC operator can create a committee called for example, “Donald J. Trump for America,” which is a slight twist on Trump’s official campaign committee, “Donald J. Trump for President,” and target supporters to raise funds. As the D.C. Circuit Court has said, scam PAC operators are within their First Amendment rights to name committees after candidates. Fraudulent activities by Scam PACs are not protected by the First Amendment. In fact, Scam PACs injure the efforts of those trying to exercise their First Amendment right to support the candidate of their choice. The Commission thus has an unusual opportunity to avoid deadlock and protect America’s political contributors with quick action attacking Scam PACs. Ravel and Weintraub proposed for the FEC to consider a number of new regulations, including requiring PACs to display web disclaimers at the top of their web pages and legislative recommendations to Congress to expand fraud provisions in FECA to encompass scam PAC behavior. Two years after the proposal, facing down the most expensive congressional election in U.S. history, the FEC and Congress have not moved to weaken or dismantle scam PACs, setting up new shops in 2018. Google the name of the PAC that’s contacted you. If the PAC is part of a network of scam PACs, a news outlet may have already covered them. If nothing pops out through a Google search, check the FEC’s website and look at the committee’s profile. It’s a lot easier than it sounds. Step 1: Look up the committee profile on the website and select the committee name. As an exercise, we’ll look at National Campaign, which we mentioned above in the post. Remember the PAC that scammed the sixty-nine-year-old man? 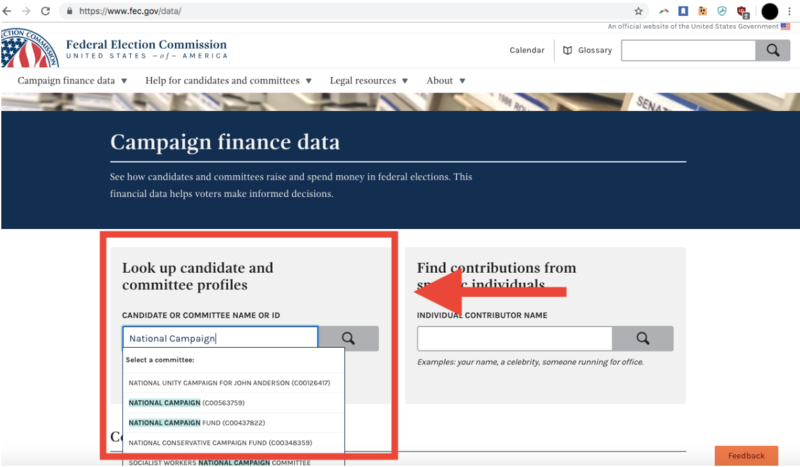 Step 2: Once on the committee’s profile, look under “About this committee.” Scam PACs are “unauthorized,” meaning that they are not authorized by a candidate. If you find that the PAC in question is unauthorized, it could be a red flag that it’s a scam PAC. Step 3: Look under the committee’s “Financial Summary” and review the committee’s total raised versus total spent. 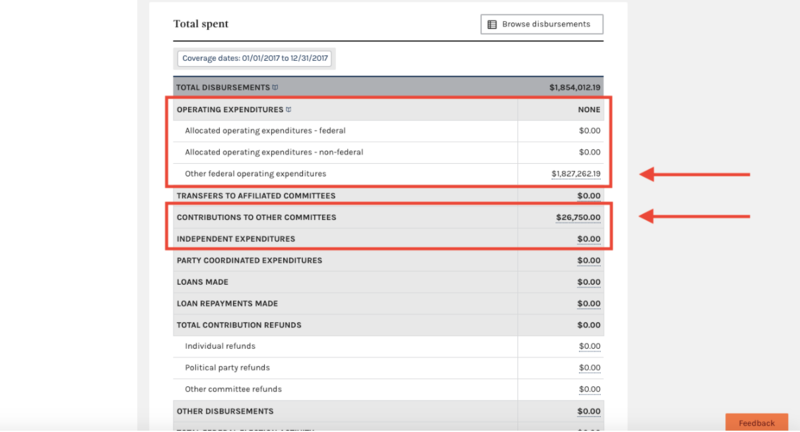 Step 4: If the committee has spent far more in “operating expenditures” than actual contributions to “other committees,” like those that belong to candidates, or “independent expenditures,” it is likely that the committee is a scam PAC. See above: National Campaign spent more than $1.8 million on operating expenditures and only $26,750 on contributions to other committees. 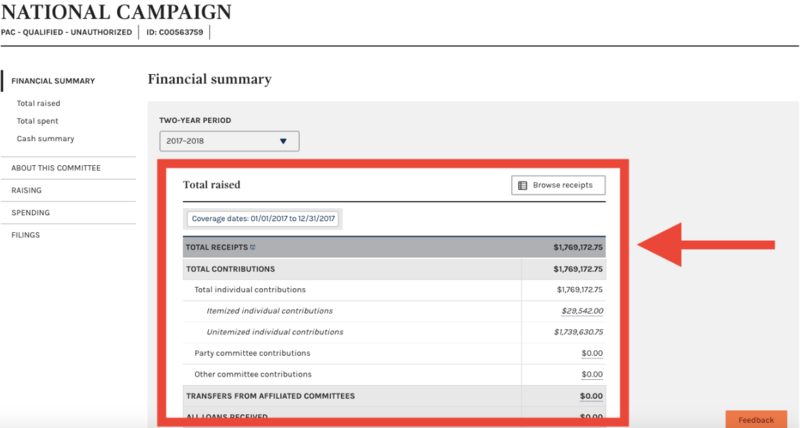 Campaign finance experts advise that PACs that spend far more on operating expenditures than contributing to candidates or on independent expenditures is a hallmark sign of a scam PAC.